Many sayings we use all the time today come from old stories and sayings, the actual meaning and origin of them forgotten or changed over the years. These days, you would typically use farming out in relation to outsourcing work “I’m farming this job out to someone else”. The term in fact comes from the 19th century when woman couldn’t afford to keep, or didn’t want their babies. There were many woman who you could pay to look after your baby, take over it’s care or for more money, adopt the child for. This was called farming out. 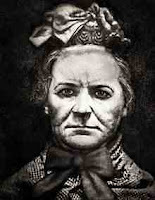 This practice hit the headlines in 1896 when the infamous Amelia Dyer was found to have murdered up to what they estimate as 400 babies. Rather than how we use the phrase now for just doing something and getting it over with, biting the bullet actually comes from the battlefields when anaesthetic was not used or available. Soldiers were given bullets to bite to help deal with the pain when having an operation. We of course use this phrase as a term for when someone is getting married. This comes from when young couples used to get married and their hands were tied together as part of the ceremony. These ties were apparently kept in place until after the wedding night. When people had guests that were overstaying or unwelcome, one of the tricks people used to use for the broad hint was rather than give the guest hot meat on their plate they were given instead, the cold shoulder. Typically we use this meaning that whatever someone has said or done, they have made the matter worse or be for painful emotionally for the person involved. The phrase actually comes from when they used to use salt in a wound in order to help the healing process. When sailors were flogged at sea, salt was typically then applied in order to clean the wound and prevent inflection. Those are a just of the sayings and phrases I have collected. There are of course loads more that ye old internet can supply. I said "Change the record" to one of my kids the other day and she asked what the hell it meant!